If you want to take on one of the grandest DIY yard projects of all time, we’re here to help. Woodmart can help give you the advice and high-quality materials you’ll need to build yourself a timber deck. Let’s get started. There are many choices for decking timber but the most popular decking timber used in Auckland, New Zealand is Pine, Vitex and Kwila Decking timber, so we’ll quickly compare and contrast a few of them. Pine is a very popular decking timber, as it’s one of the least expensive and it looks great. You can stain and paint it easily, as well. Look for the right H rating for decking. Kwila is tough, durable and lovely to look at, but it does have issues with tannin bleeding when exposed to water. Mahogany is a great choice because it is a more sustainable timber. It is a lovely pinkish to pale brown colour and it has a durability and stability that can last up to 45 years. Durable and easy to work with, Vitex Timber also produces colours from blonde and pale yellow to golden brown and olive grey. If you are building a deck in Auckland, New Zealand within a specific distance of a boundary or more than 1.5m above ground level. Make sure to check with your local council for guidelines or consents before building your deck. Determine the site for your deck, making sure to avoid anything like external plumbing and drains. Accurately mark out the length and width of the site and run string lines along the edges of your deck space to ensure a level deck. Rip up, turn, and dig post holes along the string lines. Lay out your deck bearers and fix them to the posts using the frame anchor or screw nail technique. 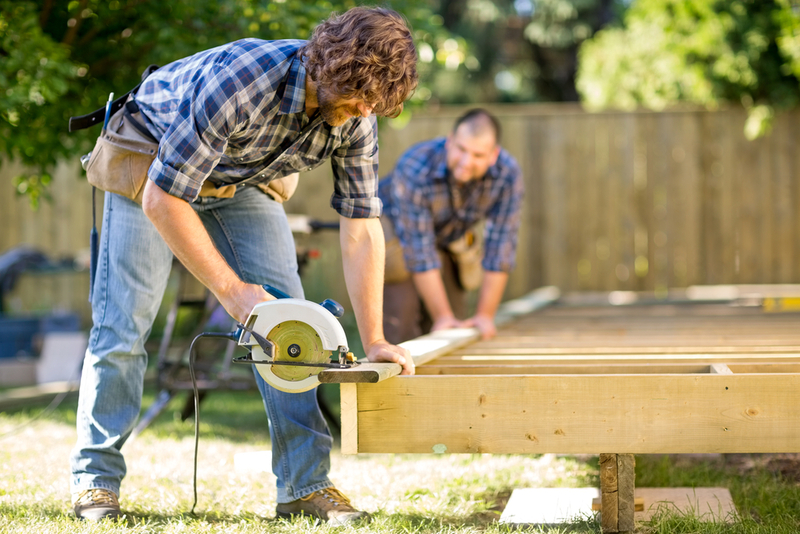 Assemble the decking frame, either as you go or pre-fabricate it before you begin. Lay the decking across the joists, beginning at one end, nailing to each joist with two galvanised nails. Fix the decking and use a saw to trim any excess wood. Like any timber project, you’ll need to make sure to maintain the wood so that it lasts longer. You’ll either want to paint or stain the deck. If you live in a rainy area, you might want to reseal and stain the deck about every two years. Woodmart, your timber supplies in Auckland with years of experience and providing you with the best quality of decking timber – vitex decking, kwila decking in Auckland. For more advice on how to build a deck, or for the materials to get the work done, get in touch with Woodmart in Auckland today!